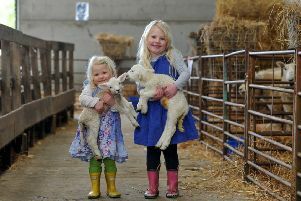 The Livestock and Meat Commission for Northern Ireland (LMC), a member of the Farm Safety Partnership, is reminding farmers and farm workers of the importance of exercising extreme caution when carrying out on-farm tasks this Farm Safety Week. Farmers and farm workers can find themselves under pressure with a workload that rarely ceases. In the case of beef and sheep, farms are often relatively small scale in Northern Ireland which means many and varied tasks are undertaken by the farmer on his/ her own and in many cases to fit in around other off-farm employment. Despite these pressures, LMC Chief Executive, Ian Stevenson says that shortcuts should not be taken when it comes to farm safety. “No matter how time poor the farmer may be, the risks still need to be fully weighed up before working with slurry, animals, equipment or potential falls when working at heights,” Ian said. “During the summer months and particularly in good weather, many children enjoy helping out on the farm but with lots of heavy and dangerous equipment on the move, it’s always a significant risk at this time of year. LMC, as an affiliate member of the Farm Safety Partnership, fully back this campaign and recognise the critical importance of improving the safety of the farm business.